Stars Ralph Bushman, Jack Perrin, Kathryn Mcguire, Edward Peil Sr. and Charlse Belcher. Wow! A very cool, little talked about "Old Dark House" comedy-mystery. This was a real treat, so much more fun than other melodramas of the period. Plus, lots of horror elements. A young man discovers that he has inherited a huge mansion from an uncle he never knew. Upon arrival the mystery begins at once with a caped figure seen climbing from window-to-window high up on the house. The stately manor is suppose to be unoccupied, but is loaded with colorful characters of mystery: a caped/masked phantom, a man in a dark hat and a mysterious oriental who can be noted peering into windows. A young woman is chased by a dark figure, a terrific fight sequence that takes place on the roof tops and continnues right own the side of the house. 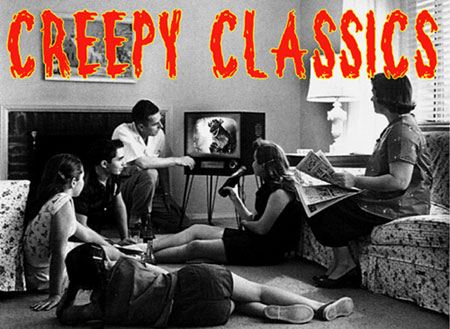 Great stuff for fans of fun classic creepy films.